Why have we chosen Italy Marilleva/Folgarida resort this time? 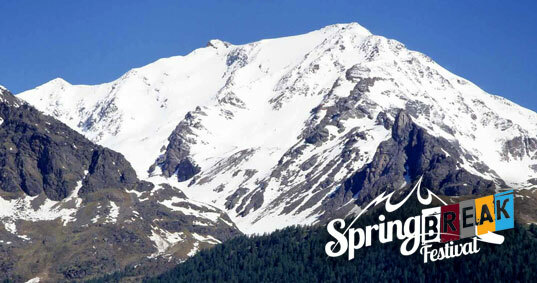 • It is a ski resort which is in many ways unusual and in spite of or maybe just because of this fact very popular. It is a unique symbiosis of „mass“ Marilleva and „middle class“ Folgarida resort, connected with the top-resort Madonna di Campiglio just behind a hill. • Basic skipass offers for Italy usual 50 km of ski slopes, but thanks to its connection with Madonna di Campiglio and since two years ago also with Pinzolo, skiing here gets a new meaning. Skipasses have wider validity and offer whole lot more skiing possibilities. • It offers balanced ratio of tracks with different difficulty and type levels ranging from options for kids and begginers over the most numerous group of average skiers to experts. • Surprisingly long and high quallity ski slopes. Let us mention at least the „black“ ski slope going or rather falling down to Folgarida. A real delight for ski gourmands and a slight contradiction to the family character of this resort. • And what´s more! If you pay more than the basic skipass, you will get bonuses in form of many interesting ski tours, now even to the far Pinzolo and more „black challenges“ in Madonna di Campiglio. The region of Val di Sole (Valley of the Sun) is one of the biggest ski resorts of Italian Dolomites. Lovers of great modern downhill tracks can expect mostly beatiful sunny weather. Val di Sole is situated at the boarder of North Italian Trentino and Lombardy. There are six ski resorts – Pinzolo, Pejo, Marilleva/Folgarida, Madonna di Campiglio, Ponte di Legno and Passo Tonale. Marileva – Folgarida – Pejo are considered the centre of this area. These three resorts have together 70 km of usually best quallity ski slopes, all of them covered with natural and technical snow. Local slopes are suitable for beginners and less advanced skiers, who will highly appreciate their spread and track layout and also for more advanced and adventutous skiers and snowboarders. Folgarida is around 1300 m above sea level in pine forests in the valley of Val Meledrio along the road connecting Val di Sole with Madonna di Campiglio. You can find here ski slopes for less ambitious ones as well as black tracks for the skilled (broken terrain and quite long slalom track going down to Folgarida) in total length of more than 40 km. At Malga Panciana there is a perfect halfpipe for snowboarders, which hosted the World Snowboarding Championship in1999. There is also a piste called Snow White with night lights and music. It offers lot of funny evenings and wide range of after skiing possibilities. Thanks to large accommodation facilities built in Frecnch style, the area offers skiing from the house door (morning skiing straight from the door) for acceptable prices. After hosting the World Snowboarding Championship ind 1999 and ten Snowboard Trofeo Topolino competitions, ski resort Folgarida/Marivella can offer two brand new snowparks fit for begginers as well as for experienced snowboarders. These parks were built in cooperation with Doors (leading group in this area). They were designed, created and tested from riders for riders – by snowboarding instructors and shapers like Paolo Fazi and Stefano Carli. Suitable for all those who would like to try snowboarding is definitely the terrain park Malghet Aut. It is located in the final part of the Provetti slope, close to the beginning of the Bamba chairlift. Suitable for more experienced riders. Malga Panciana snowpark is located straight next to Malga Panciana (by the arrival at COPAI – Panciana gondola lift). 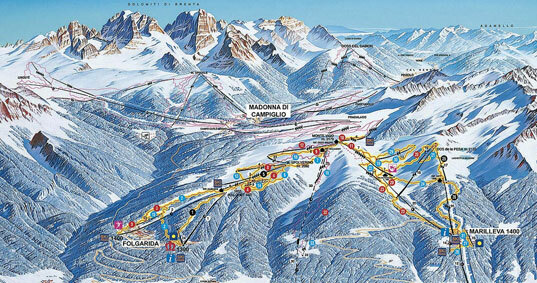 Basic skipass can be extended for neighbouring legendary Madonna di Campiglio. You can use it to ride through almost 160 km of tracks in many resorts. Freestylers will definitely appreciate the U ramp in Marileva/Folgarida, and above all the one in Madonna di Campiglio. Freeskiers can visit several areas with suitable terrain.